As a standard our packages include Rice your choice of Beans, Plates, Napkins & Forks. When ordering please specify the number of guests you will be expecting. THE TACO BAR has a minimum charge that feeds 50 Guest, for Smaller parties please contact us for special pricing. pre-arranged contract's are available for monthly employee appreciation luncheon's. TACO PACKAGE #1 - (3) types of meats of your choice, rice, beans, salsas, onion, cilantro, limes, grilled onions & grilled jalapeno peppers. 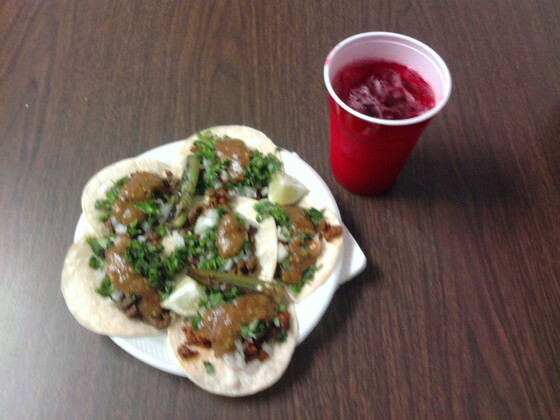 Carne Asada (Beef), Al Pastor, carnitas (Pork) & Chicken other meats also available upon request. TACO PACKAGE #2 - Baja Style Fish Tacos using Pacific Red Snapper prepared in our own signature home made batter fried on location as you order it, (From the batter to the fryer and on your taco, Fresh, Crisp and Golden right in front of you). 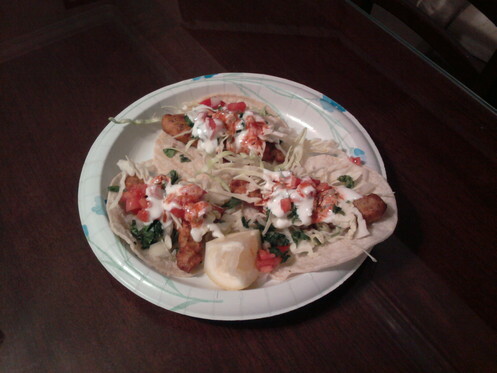 This includes the following: cabbage, onion, cilantro, tomato, white sauce, hot sauce/salsa a twist of lemon or lime. TACO PACKAGE #3 - Our combination package of (2 or 3) Regular meats and Fish Tacos with all the taco toppings described in package 1 & 2. TACO PACKAGE #4 - American Super Taco! your choice of (3) regular meats topped with sour cream, guacamole, jack cheese and salsa. TACO PACKAGE #5 - TACOS ONLY! This package is any of the above packages without rice and beans. For Vegeterian Guests, add on our assortment of fresh grilled vegetables seasoned to perfection and sprinkled with sesame seedd (per request). A great choice as not to leave them eating rice & beans or nothing at all. 1. Re-Fried Beans prepared from scratch! Hand cleaned, soaked and seasoned with salt, butter. 2. Whole beans seasoned to perfection and topped with onion & cilantro. 3. Famous beans, this is whole beans with Bacon, peppers seasoned to perfection with other secret ingredients as not to give away our long time family recipe. We get excellent reviews on our beans no matter what you choose.